Home United Kingdom: CFOs, Is The Cloud Within Your Reach? Technology decision-makers, notably CFOs and CIOs, are facing the reality that their organisation’s computing technology and data will likely be “in the cloud. ” In fact, with the cloud market expected to grow from $40.7 billion in 2011 to $241 billion in 2020, businesses will likely soon grapple with the decision of what to move to cloud, when to move it, and how to transition from an on-premises computing technology environment to a cloud computing technology environment. The decision on cloud computing is broader than the information technology department and requires a productive working relationship between the CIO and the CFO. With the CFO driving decisions he or she can embrace cloud to catalyse behaviours across the organisation and to execute strategic and financial objectives, while diligently creating a risk intelligent culture. In this CFO Blog, we look at how to test out cloud computing in your organisation as well as how to find your cloud comfort level. 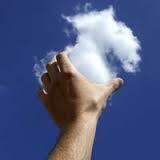 The concept behind cloud computing has existed for a long time. The basic idea is that the business outsources the day-to-day management of a resource and only buys what it needs, the quantity it needs, and when it needs that resource, similar to buying some utilities, such as power and water. Also, and in contrast to on-premises technology, the cloud computing resource is delivered over the Internet. As with any initiative with notable uncertainty, however, most organisations will pilot the use of cloud computing with either low-risk projects, or projects in which the on-premises computing resources would not normally be available. How do you know when cloud is right for you? How do I know where my data is stored? Is my data backed up? Will my data be able to be audited? What guarantees should the cloud vendor provide? Another concern relates to vendor dependency and potential “end game” scenarios. For example, what does an organisation do when and if it needs to move from one cloud technology provider to a different one? On a positive note, CFOs and CIOs mentioned that cloud vendors are likely able to provide better security and guarantee higher levels of performance. This is the line of business for that vendor and as such, they hire employees who are experts in security and in their software. Those employees do not need to know how to operate multiple systems and software applications that are typically found in corporate environments. The vendor also has an economic stake in providing high-quality, secure, reliable services; if that cloud service fails, that vendor will quickly lose clients and revenue. The basic message for companies is to become comfortable with cloud computing. Determine what type of applications are candidates for the cloud and which will not be moved until the distant future. Initially, choose applications that have low risk associated with them, or choose those that have a business need that cannot be fulfilled using traditional computing services. One critical aspect is to ensure protection against various types of misfortunes, and to have contract service level and security agreements with the vendor and a contract for end-game scenarios. While these contractual agreements will not prevent problems, they may offer some type of recourse if problems do occur. CIOs’ and CFOs’ alignment through the cloud decision can help them decide where cloud is appropriate for their organisation. The approach to determining whether cloud is appropriate involves assessing technology in the context of business purpose and risks. One recommendation is to start small and sample technologies with less risk and related influences on the business. Following the pilot approach and with greater comfort in the cloud, continue to shift the computing environment to cloud by using an appropriate assessment-based road map. For many organisations, technology does not keep up with the rate of change in business, which often results in an “ends justifies the means” culture. But with CFOs’ and CIOs’ evaluation of governance and how the availability of cloud technology can impact their organisation, they can at least help their companies drive with the fog lights on.